​​Rom 9:18-23 "Therefore He has mercy on whom He will have mercy, and whom He will, He hardens. You will then say to me, Why does He yet find fault? For who has resisted His will? No, but, O man, who are you who replies against God? Shall the thing formed say to Him who formed it, Why have you made me this way? 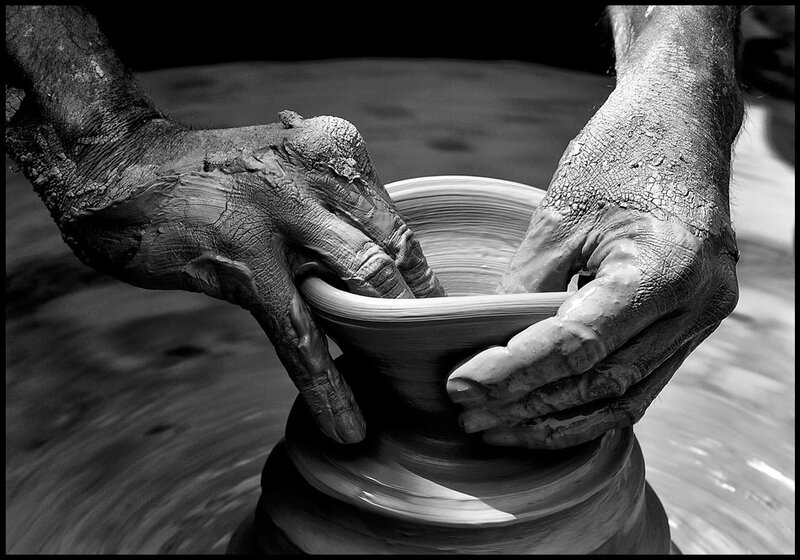 Does not the potter have power over the clay, from the same lump to make one vessel to honor and another to dishonor? What if God, willing to show His wrath and to make His power known, endured with much long-suffering the vessels of wrath fitted to destruction; and that He might make known the riches of His glory on the vessels of mercy which He had before prepared to glory;"
Sovereign Grace is all about Christ. It is the way that God saves sinners completely and fully, in a way that God receives all the glory and credit for doing so. It is salvation conditioned on Christ alone. It is a salvation that no sinner can take credit for as to brag of any merit or righteousness in them but only by the righteousness the LORD Jesus Christ earned as He was obedient in His life and death to do a work that fully satisfied all the strict demands of God's Law and unbending justice. One thing very offensive to the pride of a sinner is that in this exclusive way of salvation (there is no other way) God rules out all works or merit that sinners may try to use as a means to earn justification at Judgment and enter heaven. This would include any works of the Law or obedience in any form done by the sinner. Even actions that would credit the sinner's will or their sincerity. No prayer, no ceremony, no ritual, no system or formula, no matter how religious, pious, zealous, or done with good intentions will save, help save or add to salvation in any way. This means that salvation is by grace 100% or there is NO salvation at all. Most people in "Evangelical" churches would credit the sinner for FAITH and REPENTANCE. They do this in such a way as to credit these to the exercise of the will, making the free action by the sinner of the will be be the determining factor in heaven or hell. This shifts credit from the life and death of Christ and puts Man's will in direct competition with the glorious, perfect, finished work of Jesus Christ. God, of course, will not have that. He will never share His glory with another (a sinner especially). The word of God clearly teaches that both faith and repentance are gifts from God, which He works in the sinner by His Spirit, powerfully causing them to happen. Soon one begins to see that at every turn in describing how salvation is NOT by the works and will of the sinner and every possible cause or condition done by the sinner is eliminated. It is here that one will start to see that the remedy for sin MUST be totally in the hands of God alone and be done in a sovereign way, His way. The doctrine of God's sovereign grace is that God Almighty alone is the determining factor in who will be saved and who will not be saved. It is just that simple. In the wickedness of the natural sinful heart and mind mankind will rebel against this truth saying that it is not fair and that God does NOT have the Divine right to decide. Feel free to take that up with the LORD when you face Him at judgment. He will destroy you with such an accusation. God's word is clear in many places that He is sovereign, not only in creation and providence but especially in salvation because of is Redemptive Glory. That glory was magnified by the LORD Jesus Christ himself. Sovereign Grace is Christ-centered. These doctrines were not created or invented by man, they are Biblical and taught by the Prophets, Christ Himself and the Apostles. You may find these doctrines taught in church history also. They are nothing new to say the least. I say that because some of the nicknames assigned to the sovereign grace of God have the names of men or movements attached to them. These men or movement may have promoted, defended, systematized these doctrines and made them well publicized but they did not author them at all. Total Depravity: Mankind is in such a state when they come into the world that they have a sinful nature and are in the state of condemnation, which makes them unable do anything acceptable to God. The are said to be not good or righteous and do not understand spiritual things, and will not or cannot seek after God unless God first gives spiritual life to initiate salvation. Man's will is even affected because of his sin nature. Man, in his physical life may act religious, moral and sincere but the Bible says he is spiritually and judicially dead. Unconditional Election: Before the world was, God, in His sovereignty, purposed to set His affection on and chose a group of people, not conditioned on anything they would do in the future either good or bad, but conditioned their election solely on the merit of the LORD Jesus Christ. These are people the sovereign God purposed to save before they even sinned. Unconditional Election is Christ-centered, in that, God set fourth Christ as being the One He looks to as the only cause of acceptance and to fulfill all the conditions required in the process of salvation. Limited Atonement: Jesus Christ died exclusively for the ones God purposed and chose before the world began to save. There will not be anyone for whom Christ died that will end up in hell. He effectively saves His people based on the merit of the Person and work of Christ crucified, being the gospel aspect of TULIP. Irresistible Grace: God, using the same power it took to raise Christ from the dead, works in the heart of His chosen people to give them eternal life by imputing the righteousness of Jesus Christ to their account and regenerating them by the Holy Spirit, giving them both faith and repentance to trust Him and reject their own righteousness. It is the creation of what the Bible calls the New Man, created in righteousness and holiness. Preservation of the Saints: God preserves His people based solely upon the work Christ did for them, which put them in the unchanging, legal state of Justification. This means they are not only forgiven but also placed in the state where sin cannot be imputed or charged to them. They are both forgiven of all past, present and future sin and are judged perfectly righteous based on the imputation of Christ's righteousness. God actually dwells in the justified by His Spirit and works in them to produce good works by faith. God causes them to continue in the faith all their life, energizing them to grow in the grace and knowledge of the LORD Jesus Christ. Isaiah 46:9-11 "Remember the former things of old: for I am God, and there is none else; I am God, and there is none like me, Declaring the end from the beginning, and from ancient times the things that are not yet done, saying, My counsel shall stand, and I will do all my pleasure: Calling a ravenous bird from the east, the man that executes my counsel from a far country: yes, I have spoken it, I will also bring it to pass; I have purposed it, I will also do it."